Walker and Jones were very friendly and showed us a sneak peak (which we unfortunately couldn’t take photos of) of two pages that will be in the second issue, releasing in May. 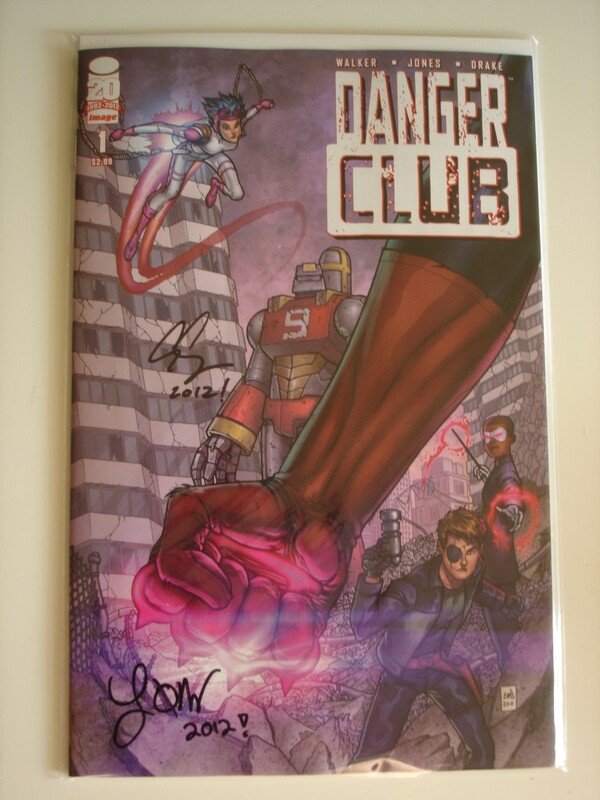 As we left Fantastic Comics with an autographed copy of “Danger Club” in our hands, we knew we had to read it. In the world of “Danger Club”, costumed superheroes, alongside their young, teenage sidekicks protect the earth from danger. One day, the superheroes leave Earth to attack a malignant force in space, only to never return. The safety of the world is left to the adolescent apprentices who are conflicted with their new found authority. The story begins in the midst of violence: three of the apprentices, Magician, Fearless and Kid Vigilante, observe fellow sidekicks cruelly beating each other in a desolated sports stadium. We find out that Apollo, one of the more powerful sidekicks, is trying to build up a new faction called the “New Olympians.” Candidates must fight each other and the victor is rewarded a spot in Apollo’s group. Kid Vigilante is disgusted with Apollo’s obsession for power and with the help of sidekick Yoshimi and her giant robot (which we assume is an unsubtle reference to The Flaming Lips ), Kid Vigilante savagely defeats Apollo and attempts to disband the New Olympians. One theme that is made clear in this first issue is that there is no clear protagonist or antagonist. Yes, Apollo is a megalomaniac who demands “obedience, loyalty and worship” from his New Olympians, but Kid Vigilante is not free from ethical entanglements as seen by his aggressive approach to achieving his goals. Eric Jones explicitly illustrates Kid Vigilante beating down Apollo until his face becomes disfigured from injury. There is no sense of neutral justice here, Vigilante’s violence comes from a deep anger that appears extreme and dangerous. Eric Jones’ artwork does an excellent job of drawing a sense of chaos that permeates the world of “Danger Club.” In one panel, you can see the destruction of the cityscape behind Kid Vigilante as buildings burn and fall apart. It all feels strangely apocalyptic and the environments are illustrated in a muted color scheme of purple, grey and brown. The dreary environments provide a contrast to the sidekicks themselves who are adorned in bright colorful costumes, making them appear almost out of place on this new Earth. The first issue of “Danger Club” is a solid introduction to the story, creating the beginnings of complex character arcs aided by detailed illustrations that reflect the gritty atomosphere. It is a promising start and we think that “Danger Club” has the potential to be a smart twist on the superhero genre. Berkeley comic book fans should check it out and keep watch for future book signings from Fantastic comics!